The stadium, located adjacent to Lansdowne Road railway station, officially opened on 14 May 2010. The stadium is Ireland's first, and only, UEFA Elite Stadium and in 2011, it hosted the Europa League Final. It also hosted the inaugural Nations Cup, as well as the regular home fixtures of the national rugby team, national football team and some home fixtures for Leinster Rugby from August 2010 onwards. The stadium is a bowl shape with four tiers on three sides of the ground; the lower and upper tiers being for general access, the second and third levels feed the second tier for premium tickets and the fourth tier for corporate boxes. The northern end of the stadium, due to its proximity to local housing, incorporates only the lower tier of the bowl. The North Stand is to be the away stand for football internationals. 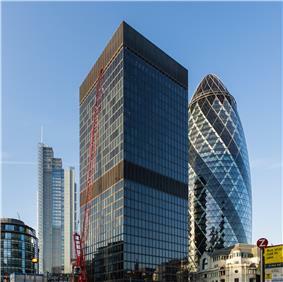 There is one basement level and seven storeys of floors including ground level. The premium level holds 10,000 spectators, while the box level holds 1,300. The remaining 38,700 seats are shared between the top and bottom tiers. The capacity of the stadium was criticised even before its opening for being too small, particularly in light of the large supporter attendance figures for Irish rugby internationals and soccer internationals at Croke Park since 2007. The stadium's roof is designed to undulate in a wave-like manner so as to avoid blocking light to local residences. The Ireland rugby union team is playing its home games at the stadium, as it did previously at Lansdowne Road, taking over from their temporary home, Croke Park, where games were played during Aviva's construction. Ireland's first international game was on 6 November 2010 against South Africa, with the Springboks winning 23–21. The game drew a disappointing crowd of 35,515, mainly due to a backlash by Ireland supporters over the IRFU's controversial ticketing strategy for the November Test series. 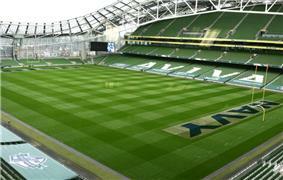 Initially, the IRFU announced that tickets to the November Tests would only be sold as packages for all four matches. Later, it announced that the tickets would instead be split into two packages, with the South Africa Test bundled with the following week's match with Samoa for a minimum of €150, and the New Zealand and Argentina Tests bundled for a minimum of €190. Single-game tickets were to be available only for the Samoa and Argentina Tests. On 1 November, the IRFU backed away from this plan amid heavy criticism from member clubs that had problems selling the packages in a difficult economy. Leinster won their first Heineken Cup game in the Aviva 24–8, against Clermont Auvergne in a pool game during the 2010–11 season. During Leinster's successful run to the Heineken Cup title that season, they took their quarter-final and semi-final matches to the Aviva, defeating Leicester Tigers and Toulouse respectively. Ulster took their 2012 Heineken Cup semi-final to the Aviva as well, defeating Edinburgh. The 2013 Heineken Cup Final took place in the Aviva Stadium on 18 May 2013 where Toulon beat Clermont Auvergne 16-15. The Heineken Cup final was last held in Dublin in 2003 when Toulouse beat Perpignan 22–17 at Lansdowne Road. 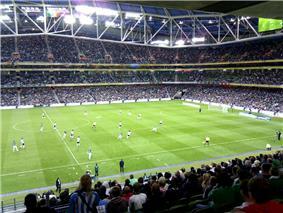 The stadium also hosts the home games of the Republic of Ireland, as did Lansdowne Road. The team had played most home games at Croke Park during the construction of the Aviva. The first soccer match in the Aviva was Manchester United against a League of Ireland XI side, managed by Damien Richardson, on 4 August 2010. Manchester United won the game 7–1, with Park Ji-Sung scoring the first ever goal in the Aviva Stadium. The first international game for Ireland in the Aviva Stadium was a 1–0 friendly loss against Argentina on 11 August 2010. The first competitive goal was scored by Kevin Kilbane in a Euro 2012 qualifying game on 7 September 2010 against Andorra. The Aviva annually hosts the FAI Cup Final, which was shared between the RDS Arena and the Tallaght Stadium while the Aviva Stadium was being built. The first Cup Final at the new stadium was the 2010 FAI Cup Final, held on Sunday 14 November 2010. Sligo Rovers beat Shamrock Rovers 2–0 on penalties after the game finished 0–0 after extra time. A total of 36,101 attended the game making it the biggest attendance at an FAI Cup Final since 1968. Tickets for the finals are to be included as part of the ten-year international tickets. The 'Dublin Decider' was a game which took place on the 10th August 2013. The match was played between Celtic and Liverpool, with both teams having large support in Ireland. Celtic won the match 1-0 thanks to a goal from Amido Balde. There are supposed to be talks ongoing about a return of the 'Dublin Decider' in the summer of 2014 with clubs such as Barcelona, Manchester United and Celtic being mentioned as potential visitors to the Aviva Stadium. On 1 September 2012, the stadium hosted an American college football game billed as the Emerald Isle Classic between the Notre Dame Fighting Irish and the Navy Midshipmen. Notre Dame won 50-10. The stadium is served by public transport with Bus and DART. More remotely, it may also be reached, following a journey on foot by the Luas and Busáras. The stadium is inaccessible by car on match days due to a 1 km car-free exclusion zone in operation. ^ "FAI can steer clear of Aviva turbulence". Independent.ie. Retrieved 23 November 2014. ^ "Final touches at Aviva for the American revolution". Independent.ie. Retrieved 24 November 2014. ^ "Notre Dame Fighting Irish vs. Navy Midshipmen - Box Score - September 01, 2012 - ESPN". ESPN.com. Retrieved 24 November 2014. ^ "Empty feeling not lost on O'Gara". The Irish Times. 7 November 2009. Archived from the original on 10 November 2010. Retrieved 28 November 2010. ^ "IRFU Ticket Price Announcement" (Press release). Irish Rugby Football Union. 29 November 2010. Retrieved 29 November 2010. ^ Gallagher, Paul (2 February 2009). "Lansdowne to be renamed Aviva Stadium". The Irish Times. Retrieved 19 February 2010. ^ "Vincent Hogan: Aviva - the most expensive second home in history". Independent.ie. Retrieved 24 November 2014. 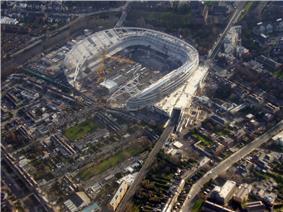 ^ "'"Kevin Myers: 'New stadium is an irreversible and huge tragedy for Irish sport. Independent.ie. Retrieved 24 November 2014. ^ Harrison, Shane (14 May 2010). "Gates open at new national stadium". BBC News (BBC). Archived from the original on 17 May 2010. Retrieved 14 May 2010. ^ "Lansdowne Roar to live on at Aviva". RTÉ Sport. 14 May 2010. Retrieved 24 November 2014. ^ "BBC News - Gates open at new national stadium". News.bbc.co.uk. Retrieved 24 November 2014. 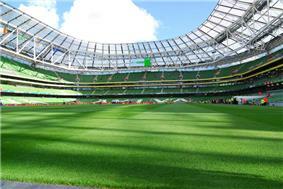 ^ "Sport-Dublin opens new Aviva stadium after three years". Uk.reuters.com. Retrieved 24 November 2014. ^ "BBC Sport - Ireland 46-24 Argentina". BBC Sport. Retrieved 24 November 2014. ^ "Ireland (0) 6 - 12 (6) England (FT)". ESPN scrum. Retrieved 24 November 2014. ^ "Ireland (13) 13 - 13 (3) France (FT)". ESPN scrum. Retrieved 24 November 2014. ^ ESPN Staff. "Ireland Rugby: Ireland make light work of Samoa - Live Rugby Match Pack - ESPN Scrum". ESPN scrum. Retrieved 24 November 2014. ^ "Ireland 15-32 Australia: Australia power past Ireland - Live Rugby Match Pack - ESPN Scrum". ESPN scrum. Retrieved 24 November 2014. ^ ESPN Staff. "Ireland 22-24 New Zealand: Last-gasp All Blacks break Irish hearts - Live Rugby Match Pack - ESPN Scrum". ESPN scrum. Retrieved 24 November 2014. ^ "Rugby Union - ESPN Scrum - Leinster v Northampton Saints at Lansdowne Road". ESPN scrum. Retrieved 24 November 2014. ^ ESPN Staff. "Six Nations Rugby: Ireland ease past Scotland - Live Rugby Match Pack - ESPN Scrum". ESPN scrum. Retrieved 24 November 2014. ^ ESPN Staff. "Ireland 26-3 Wales: Superb Ireland lay down title marker - Live Rugby Match Pack - ESPN Scrum". ESPN scrum. Retrieved 24 November 2014. ^ "Ireland take big step towards Six Nations title". espnscrum. Retrieved 8 March 2014. ^ a b "O'Driscoll try leads Leinster to hard-fought victory". ^ ESPN Staff. "Ireland v South Africa: Jonny Sexton stars as Ireland defeat Springboks 29-15 at Aviva Stadium - Live Rugby Match Pack - ESPN Scrum". ESPN scrum. Retrieved 24 November 2014. ^ "Ireland power past Georgia". espnscrum. Retrieved 18 November 2014. ^ "Ireland hold on in Wallabies thriller". espnscrum. Retrieved 23 November 2014. ^ "O'Gara pleads with Ireland fans". ESPN Scrum. 7 November 2010. Archived from the original on 11 November 2010. Retrieved 7 November 2010. ^ "'"IRFU admits ticketing 'strategy error. The Irish Times. 1 November 2010. Archived from the original on 5 November 2010. Retrieved 7 November 2010. ^ "Leinster 17 Leicester 10: match report". The Telegraph (Telegraph Media Group). 9 April 2011. Retrieved 20 November 2012. ^ "Heineken Cup semi-final Ulster v Edinburgh: Just the ticket and 40,000 Ulster fans want one". Belfast Telegraph. 12 April 2012. Retrieved 20 November 2012. ^ "Heineken Cup final returns to Dublin in 2013" (Press release). ERC Rugby. 9 June 2011. Retrieved 9 June 2011. ^ "Brendan Rodgers: It's harder for Irish players to hit big time". Irish Independent. 15 May 2014. Retrieved 15 May 2014. ^ "Republic of Ireland 1-2 Turkey". RTE Sport. 26 May 2014. Retrieved 27 May 2014. ^ "Red Devils to face Airtricity League XI". RTÉ Sport (Raidió Teilifís Éireann). 12 May 2010. Archived from the original on 15 May 2010. Retrieved 12 May 2010. ^ "BBC Sport - Football - Airtricity League 1-7 Man Utd". News.bbc.co.uk. Retrieved 24 November 2014. ^ "Ireland are Carling Nations Cup champions". Setanta Sports. 30 May 2011. Retrieved 20 November 2012. ^ "Thousands of soccer fans flood city for Europa final". Herald.ie (Independent News and Media). 19 May 2011. Retrieved 20 November 2012. ^ "Manchester City win Dublin Super Cup". Extratime.ie. 31 July 2011. Retrieved 20 November 2012. ^ "Mario Balotelli back in favour as Manchester City rout Internazionale". guardian.co.uk (Guardian News and Media). 31 July 2011. Retrieved 20 November 2012. Portugal, Brazil, Spain, S.C. Braga, Arsenal F.C.